In China, the Philippine leader advances cooperation in the economic, defense, and media sectors. Philippine President Rodrigo Duterte found a warm welcome on his latest visit to China – and apparently sees a lot to emulate in Chinese leader Xi Jinping. Duterte visited Hainan Island to take part in the Boao Forum for Asia, and held a bilateral meeting with Xi on April 10 before heading to Hong Kong for a working visit. The visit to China comes amid a broader recalibration in the China-Philippines relationship, as Duterte has made it clear he is willing to overlook overlapping maritime claims in the South China Sea in return for economic support from China. In addition, Duterte’s own autocratic tendencies – including a “war on drugs” that critics say has seen thousands of innocents killed – have made him lean ever closer to China as criticism pours in from the West. Duterte’s time in China resulted in the usual wave of business and government deals. According to Philippines presidential spokesperson Harry Roque Jr., China agreed to provide 3.8 billion Philippine pesos ($73 million) in “economic and infrastructure assistance.” Separately, China and the Philippines signed agreements on economic cooperation, agricultural technology, and infrastructure projects, including the Davao City Expressway and the Chico River Pump Irrigation Project. Later, Duterte looked on (and expressed his happiness) as Chinese companies signed deals that the Philippine government said could be worth over $9 billion. The deals ranged from energy projects to joint endeavors in the tourism, electronics, pharmaceutical, and construction sectors. 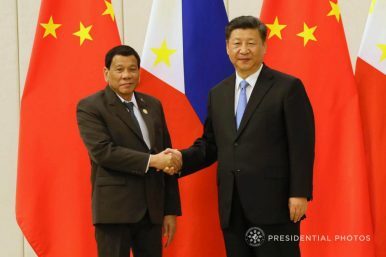 “Allow me to mention again the efforts … to show the goodwill and sincerity of my country vis-a-vis with our new relationship with China,” Duterte said. Those efforts have paid off. As Xi Jinping put it in his meeting with Duterte, “China-Philippine relations have opened a new chapter since” Duterte assumed office. “China-Philippines relations have experienced from [sic] ‘turnaround’ to ‘consolidation’ in the past two years, ascending two steps in succession,” Xi said. “The task of this year should be ‘improvement’” of the relationship. “China supports the Philippines in its efforts to push forward anti-terrorism, drug elimination, and crime eradication campaigns,” Xi said. Duterte, for his part, praised China for its help during last year’s terrorist siege of Marawi City, saying the Chinese aid “spelled the difference between victory and defeat” (although, as Prashanth Parameswaran noted for The Diplomat, U.S. aid was far more substantial). China had provided rifles, ammunition, and sniper cones to assist in the Philippines’ security operations. Interestingly, Duterte pointed out that a Chinese rifle had been used to kill Isnilon Hapilon, the leader of the terrorist forces in Marawi. The Philippine president, after praising earlier efforts, pushed for more military and defense cooperation, saying the two sides “can do more.” Duterte particularly promised Manila’s “fullest cooperation” in fighting terrorism and transnational crimes such as drug trafficking alongside China. “I’d like to say it in a very short way — we are with you in this,” he said, according to a press release from the Philippines’ Presidential Communications Operations Office (PCOO). Manila may also be “with China” in its approach to the media environment — a worrying sign for those already troubled about the state of the freedom of the press under Duterte. Xi spoke of increasing exchanges and cooperation between Chinese and Philippines media outlets, including continuing an existing arrangement for Philippine government media personnel to study in China. In addition, China has agreed to help develop the infrastructure for a Philippine government broadcasting system. “It is a very good indication that China is very committed to helping our government media in the Philippines in improving its services,” PCOO Secretary Martin Andanar said. Private press organizations, however, might not be so sanguine about the implications of the Philippine government learning from China, given Beijing’s heavy-handed media controls. In keeping with Duterte’s approach to the relationship, both sides downplayed their disputes over features in the South China Sea. The Philippines has gone from being, under the previous Aquino administration, the most aggressive rival claimant in voicing opposition to Beijing’s maritime claims, to largely keeping quiet about the disputes under Duterte. China hopes to turn over a new leaf in relations with Manila.